UUCA delegates gather with NISGUA staff in Antigua. This past December, NISGUA organized and hosted a ten-day delegation with the Unitarian Universalist Church of Arlington (UUCA), home to NISGUA Sponsoring Community, Partners for Arlington and Guatemala (PAG). Twelve members of the UUCA congregation formed the delegation and traveled to Guatemala to see NISGUA’s work up close and to hear directly from Guatemalan human rights defenders on the ground.PAG combines strategic local action and advocacy in partnership with the Arlington immigrant community and supports and monitors human rights in Guatemala. PAG has supported over a dozen human rights accompaniers since becoming a NISGUA Sponsoring Community in 2006. In addition, PAG partners with the Jefferson Unitarian Church in Golden, Colorado to fundraise for the Guatemala Scholarship Program that benefits youth from families affected by the Maya Achí genocide. 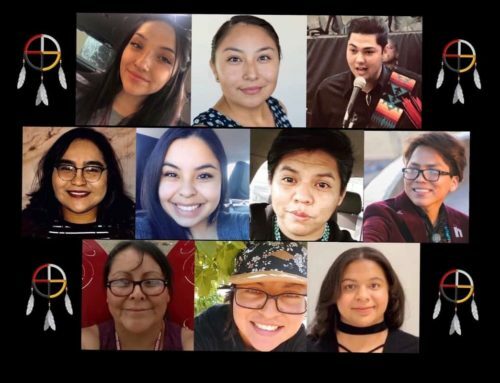 The December delegation met with a total of 13 organizations, dozens of scholarship recipients as well as current NISGUA accompaniers. 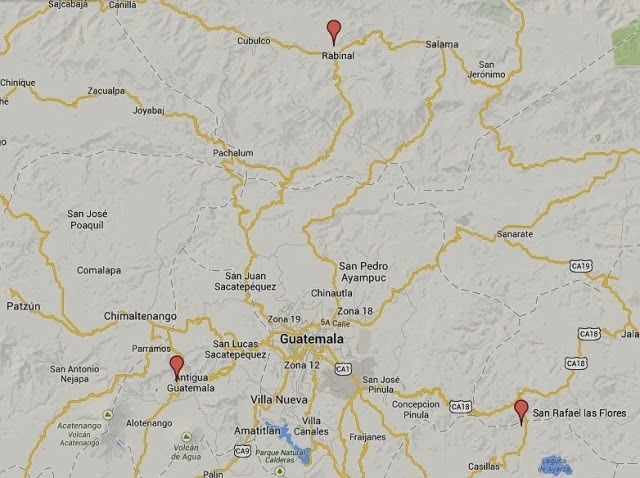 UUCA delegates visited Guatemala City, Rabinal, San Rafael las Flores and Antigua. After a short orientation in Guatemala City, the delegation started its journey of learning and exploration in Rabinal, Baja Verapaz. In coordination with the Association for the Holistic Development of the Victims of the Violence, Maya Achí (ADIVIMA) who runs the Guatemala Scholarship Program, delegates met with PAG’s scholarship recipients. Students had the opportunity to publicly address the delegates and share how PAG’s support has helped them in completing their studies. The ADIVIMA scholarship program commits to supporting recipients through the duration of their studies and a number of recently graduated students proudly shared their accomplishment with the delegates. The next day, delegates traveled to scholarship recipients’ homes to see the conditions and distance that students have to traverse in order to study. UUCA delegates trek to scholarship recipient’s homes in Rabinal. Seeing student’s homes gave delegates a better sense of the journey they make to school. UUCA delegates had the special opportunity to meet with a NISGUA accompanier working in the Rabinal region alongside Maya Achí genocide survivors and members of the Association for Justice and Reconciliation (AJR). 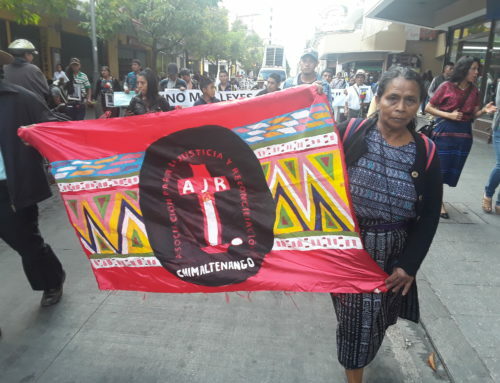 Upon returning to Guatemala City, UUCA delegates were able to directly connect with the AJR and hear about their recent victory in the historic genocide trial, as well as reflections on what drives and inspires their ongoing struggle for justice. UUCA is no stranger to the work of the AJR, in fact, they recently opened their church and homes to AJR President Anselmo Roldán Aguilar during NISGUA’s fall tour. Providing another opportunity to deepen their relationship, the dinner with the AJR was a true highlight of the delegation. We further connected UUCA to other areas of NISGUA’s work with a visit to communities impacted by Tahoe Resources’ Escobal silver mine in San Rafael las Flores. 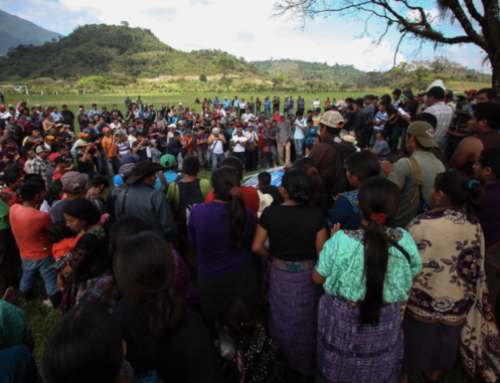 Delegates met with the Committee in Defense of Life and Peace, made up of community members living closest to the mine site. Community members took delegates to see the project, highlighting the proximity of the mine to crops, water sources and homes. 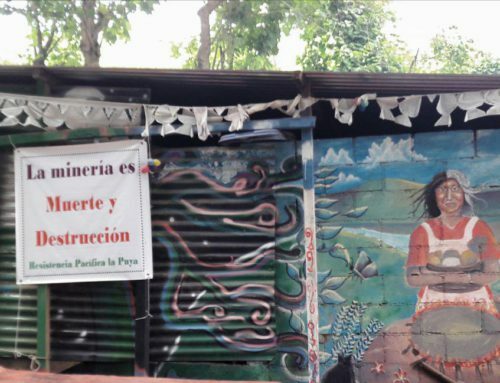 Delegates were further immersed in the issue, with a visit to Santa Rosa de Lima to share with the Catholic Church organization, CODIDENA, responsible for organizing and promoting the community consultation process of 2011 and the ongoing peaceful resistance to the Escobal mine. UUCA and CODIDENA strongly connected through their shared sense of faith and commitment to justice. Delegates observed the Escobal mine, owned by Tahoe Resources, in San Rafael las Flores. In addition to information gathering and relationship building, UUCA delegates took strategic action, meeting with the US embassy and making plans to follow-up on their observations post-delegation. 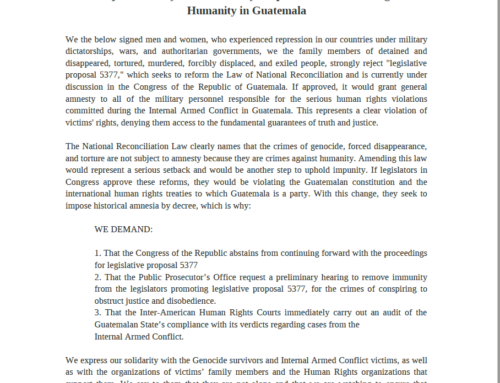 The embassy visit gave delegates the opportunity to express concern around human rights issues revealed throughout the trip – increased militarization, rising repression against communities defending territory and the denial of justice in the genocide case. The meeting laid the groundwork for further sessions, action planning and continued monitoring of the human rights situation upon returning to Arlington.All twelve delegates made personal commitments to share their experiences in Guatemala with their congregation and community. In fact, UUCA devoted time during its January 5 service for delegates to talk about their trip to Guatemala and share what the thousands of other members of the church could not see. Delegates returned to the US with a truly renewed commitment and inspiration to continue their support for justice in Guatemala. 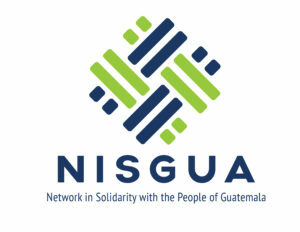 NISGUA plans to begin outreach for a 2015 delegation later this year and will continue to support groups visiting Guatemala.